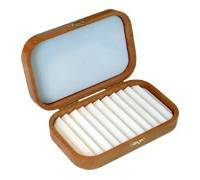 Wooden Fly Boxes with flat foam, ripple foam and compartment inserts. De luxe presentation wooden fly boxes in cherry wood, american black walnut, bamboo and oak. Larger mahogany fly boxes for bulk fly storage. 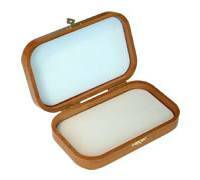 Light Wood Varnish Finish High Quality Fly Boxes. Brass hinges and closure catches. Lined with high quality 4mm Ethfoam. Hand-crafted fly boxes machined from either Cherry or American Black Walnut. Each box has three coats of hand applied clear varnish and comes complete with hinges, clasps and solid brass name plate. The interiors are fitted with flat foam, ripple foam or 16 dry fly compartments. These boxes make the perfect presentation or gift. 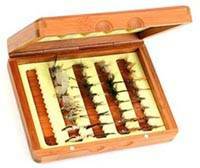 Size in inches: 6 1/2 " x 4 " x 1 7/16"
A handsome pocket-sized fly box crafted from mellowed split cane. Slotted foam inserts securely hold trout and salmon flies. Brass hinged with magnetic closure. finished with a natural satin lacquer, this beautiful box is lightweight and floats - but is almost too nice to take fishing. Flies not included.